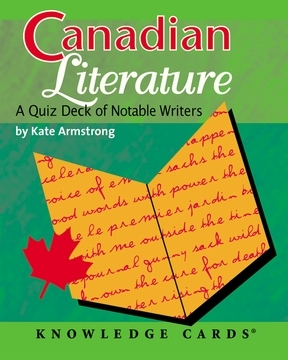 Canada has birthed a lot of excellent writers with interesting personal histories. This deck, well written itself, names some of them and gives brief accounts of their works and exploits. Can you name the former University of Calgary professor whose novel launched the movie Field of Dreams? How about the Ontario-born writer and economist who was John F. Kennedy's ambassador to India, or the British Columbia poet who is married to a notorious bank robber? This Q&A deck takes you on an absorbing tour of Canada's literary landscape in all its grand diversity. From the weighty (such as giants Robertson Davies, Saul Bellow, and Hugh MacLennan) to the whimsical (the grande dame of Canadian literature's delightful nom de plume; a prolific historian's propensity for bow ties and opera cloaks), these 48 profiles are sure to edify, inform, and entertain.